Lately, I took a Hello Glow Whitening Plus Facial Polish 7 Days Challenge. I got my 30 mg PR sample bottle for review from Lee Baker. She is promoting Hello Glow products in Pakistan. Coordinating with her was a very nice experience indeed. Hello Glow products have got so much hype, and a lot of girls are raving to use their masks and skin polishes. The reason behind this is they manufacture 100% natural and preservative free products. A miracle combination of pure, natural powders to instantly whiten and polish your skin, promoting a blemish free, radiant complexion. It entailed Rice Powder, Coconut Milk Powder, Milk Powder, Honey Powder, Potato Starch. 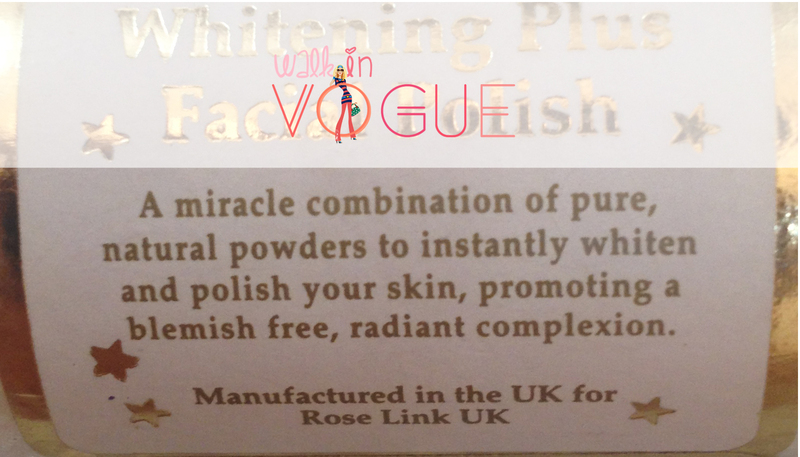 This facial polish is actually white, granular powder form, filled in a travel friendly, sturdy, transparent plastic bottle with a white screw cap. The label contains the gold logo and titles over a white background. Pour some powder onto wet hands. Rub together and apply all over moistened face. Massage gently for 30 seconds, and rinse off with cool water. Pat dry. I followed the same method for the first two days as directed on the bottle, but after that I made a paste in a bowl, massage it on my face in circular motions, and then leave it on my face to let it dry for a few minutes. So the product can completely impact on my skin. First of all, I would like to mention here some facts about my skin. I have a combination skin, also my skin is highly sensitive. After undergone any facial concoction, my face heats up and breakouts. So I do not possess a regular skin care routine, but I always look for such mild skin care items that give me instant results. I fell in love with the smell as soon as I opened the bottle. The powder has an extreme coconut scent. I literally does not find its essence bothersome at all. At first use, I felt like I had gone through an oily facial massage, but I was astonished to discover my face was totally non greasy after wash. The powder is so mild that it glides over the skin and exfoliates gently. I did not feel to put on any moisturizer on my face for some time, as it does not dries or tightens my skin at all. After having it for 7 days, it gives me a silky touch, preventing my T-zone to become oily again for several hours. It leaves my skin super smooth and moisturized. However, that effect is not long lasting. It has really polished my skin, and brightens up my face at once. My winter’s dull complexion has started glowing now. It removes all the dirt, oil, and dead skin layer, and unveiling my real complexion, leaving my face soft as baby skin. It is recommended to use this polish twice a day. But I was afraid because my skin starts to irritate and scratchy after using facial products. So I just used it once in a day to avoid rashes. 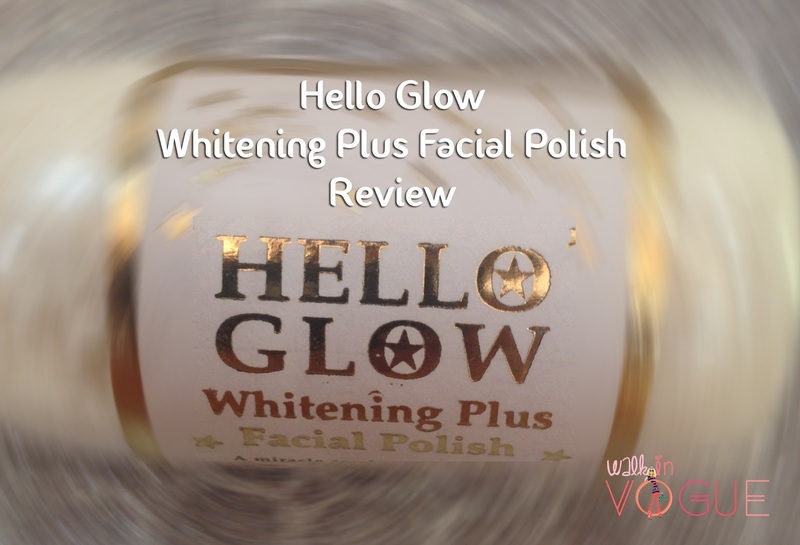 The most noticeable fact is the exfoliating procedure of Hello Glow polish does not renders any blemishes, and my face does not becomes itchy. Up till now, I have gained a much better clean skin. The flaky patches at the central part of my face feels much hydrated now. The skin has become even and radiant. Yet, it is not visibly noticed that my tanned skin has starting fading out, but I’m sure using it for a few months will give me more clear outcomes, and will lighten my complexion too. I’m planning to apply it daily now, after using my face wash. Because I have discovered one more surprising fact about Hello Glow polish. It can act as a primer too. Yes! it has constructed my facial texture so soothing, that I do not feel the need to rub any ice cube or apply a primer before wearing makeup. – Boosts up the real complexion. – Does not tightens the skin. – Does not makes the skin greasy. – Does not makes the skin dry. – Makes skin smooth, silky, and mild. – Removes dullness, oil, dirt, and dead skin. – Fades out the blemishes. – It has the strong smell. – Do not expect it as a fairness polish. – Does not removes the dark spots completely. It really does, what it claims! Honestly saying it is the best skin care product I have ever used. It does not leave any bad impression on my super sensitive skin. You should give it a try, at least once. I bet you will buy this polish again and again. Definitely, I will repurchase it! Its a perfect gift for fall. I do not need to buy expensive skin care oils or creams now. This one product is enough to replace all other stuff. – 30 mg for 500 PKR. – 100 mg for 1500 PKR. Hello Glow Products are available online at their website www.roselinkuk.com and facebook page Hello Glow Pure Skincare. And now, they are also available at Roop Singhar and Rahim Store in Lahore. This looks great, I didn't try this , nice review hon. This powder sounds amazing. The natural ingredients used already sound so yummy and very smart move at mixing it into a paste. I would do it like you do too coz I would think that the product is resting on my face longer. Thanx for the detailed review! I love organic products too. This seems to be a nice thingy. Looks like a very good product for daily use. Thanks for detailed review.